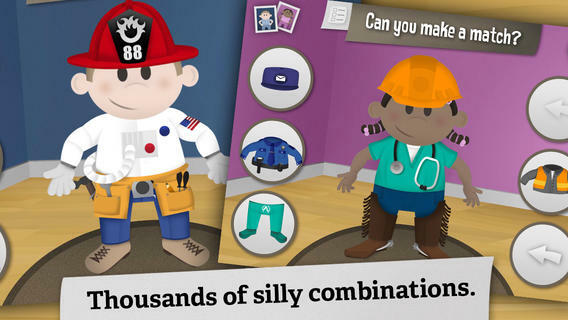 FREE today – Swapsies Occupations, a cute educational app for toddlers. The app features 10 community helpers – baker, pilot, mail carrier, doctor, police officer, firefighter, builder, astronaut, engineer, and rancher. There are two different modes: a dress-up game and an interactive quiz. In the dress-up game mode, kids mix-and-match hats, tops, & bottoms to find the correct combination. Once the clothes are properly matched, a fun activity is unlocked for each occupation. The quiz mode is age-appropriate. Kids are asked to make connections, reason, and classify – find 3 things that fly, find 2 things that are round, find 5 things a baker uses, etc. Additional information is available in the parents’ section where you can download the Swapsies Occupations App Guide. This app was featured in Apple’s Apps for Preschool and Kindergarten. It’s also a Parents Choice Award winner. Nicely done! !